I've been waiting to get to this exchange ever since day one, now I can finally point at this page to confirm that this is how it is!! My beautiful son! 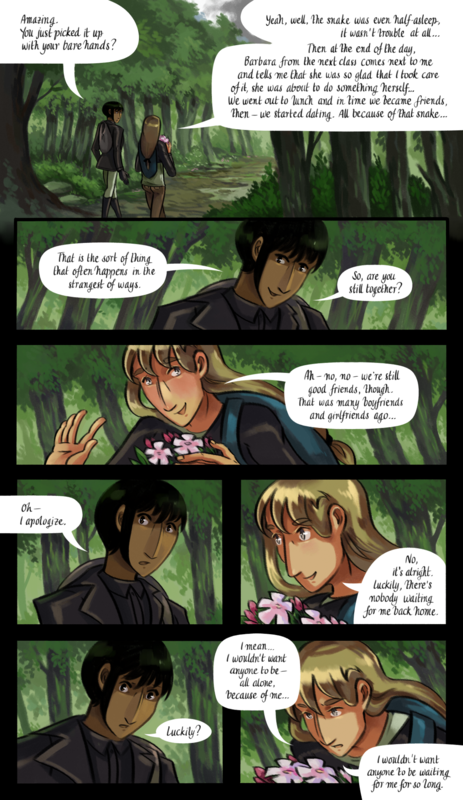 Furthermore about this page: take note of how Val and Adrien are talking to each other. Take note of Val's worried reaction, and of the bit of darkness that seeps out of Adrien in reply. The full extent of what Adrien is alluding to will play a huge part in a later plot development. Not to mention, "that is the sort of thing that happens in the strangest of ways". About that. One last thing: if you go back one page, you can see Barbara in the second-to-last panel - she's the girl with the glasses in the pink and red shirt.